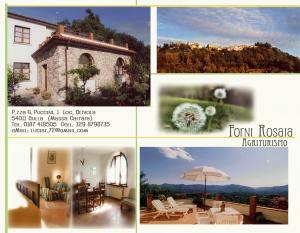 In a quiet corner of north Tuscany, Lunigiana region, where traditions are strong, hospitality generous "Forni Rosaia Agriturismo" provides you a traditional accommodation in this beautiful region of Italy. 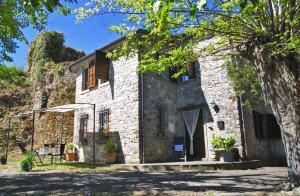 "Forni Rosaia Agriturismo" is away from the tourist paths, in idyllic location with spectacular views over the hills a way to experience the authentic slow life and explore the hidden treasures of the charming Lunigiana! For a single overnight stay, a weekend trip or a holiday break of a week.. This property is available for booking on the same day, last minute and last second booking. The Lavanda room features matrimonial bed and ensuite bathroom, a fridge, electric kettle and private panoramic balcony - terrace (34 m²). 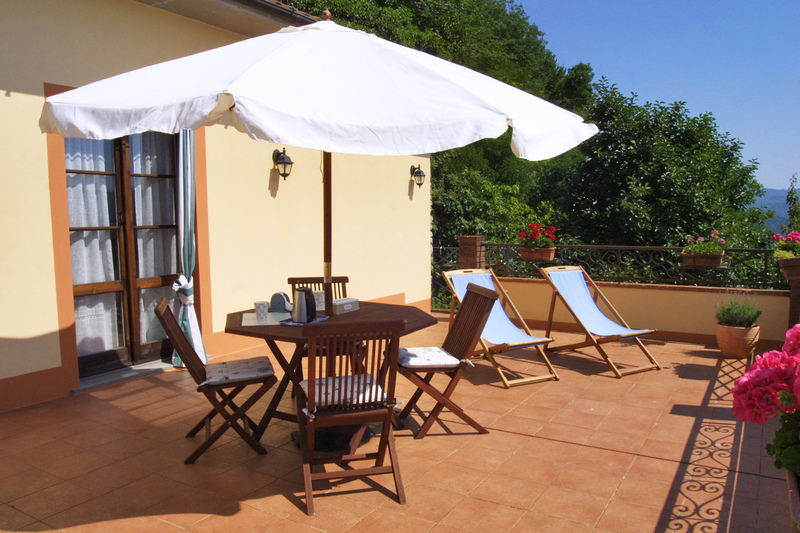 The large sun terrace is equipped with chairs and dining table, sun chairs and umbrella. The double room rate is 70 - 75 EUR per night. The price includes also: water, electricity and gas consumption, linens (bed linen, towels) all taxes, final cleaning. A family friendly cottage. The cottage is comfortably furnished, there is a spacious bedroom with a matrimonial bed upstairs and the other twin beds. The living area features original vaulted ceiling and exposed stone walls. Outside, a cosy area with gazebo, deck-chairs, table and chairs with view of the Church, the village and surrounding Appennini mountains. A short walk near the church offers a beautiful view of Alpi Apuane mountains. 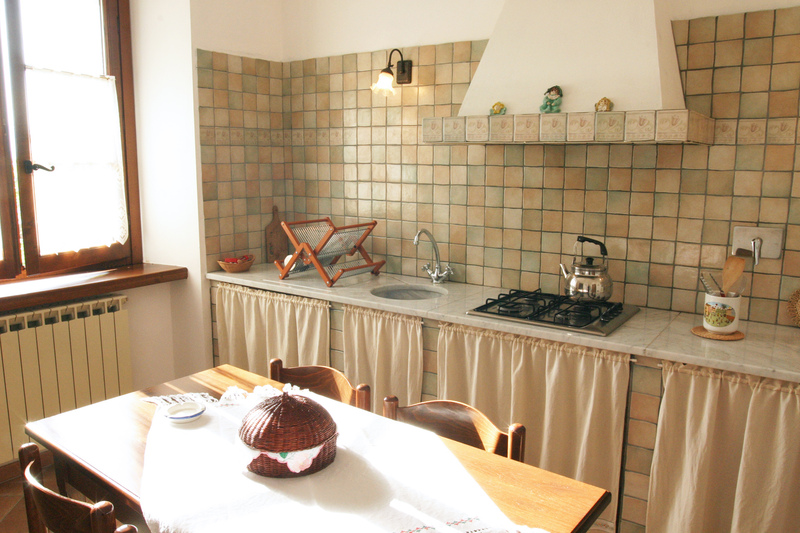 This attractive apartment, full of Tuscan charm and character, was completely refurbished. Ground Floor: an antique chestnut door opens into a living/dining room (surface 30 m²) offer spacious living and ample room to relax in after a day out. A large table can accommodate up to 8 people and a sofa bed provides accommodation for 2 guests with the convenience of a tiled bathroom with shower, WC, bidet, washbasin. A custom designed kitchen with Carrara marble work surfaces, it is supplied with an hob, microwave, large fridge with freezer top, kettle, table and chairs, a cozy sitting room features original part exposed stone wall and is furnished with sofa fire place and wooden stairs lead to upper floor. Outside, close to the apartment: a private sitting area with table, chairs and umbrella for guests to enjoy alfresco eating and the evening sunset. 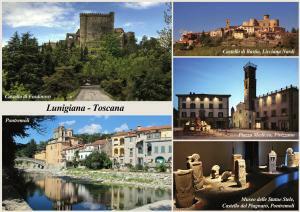 Lunigiana area often called the ‘land of the moon’ or ‘land of a hundred castles.. 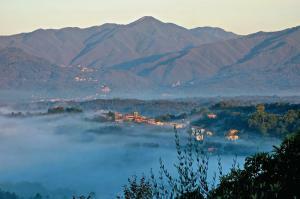 Wherever you look in Lunigiana, outlines of castles and fortified villages can be seen. Most of these were built by the Malaspina family to defend the strategic position of this ancient land. Today many have been restored, while others remain romantic ruins. The Piagnaro Castle in Pontremoli, the northern gateway of Lunigiana, home of the Museum of Statue Stele-Menhirs. 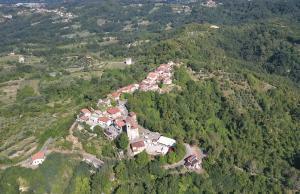 The Brunella Fortress, in Aulla - now the Lunigiana Natural History Museum - stands high on a hill overlooking the town. In Fosdinovo - a well-preserved fairytale Malaspina Castle, mentioned as early as 1084, rises majestically above the borgo below. 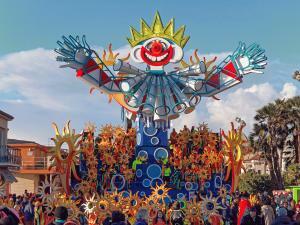 All seasons host many medieval events where village streets are lit by candle light, street entertainers dress in costume, cantinas open selling local handicrafts and long tables are laid to enjoy the local recipes. Swimming in the Meditteranean at Lerici and Cinque Terre, Marina di Massa,..
Cinque Terre, which means Five Lands, is part of the UNESCO World Heritage List, and comprises the five small coastal villages of Riomaggiore, Manarola, Corniglia, Vernazza, and Monterosso located in the region of Liguria. 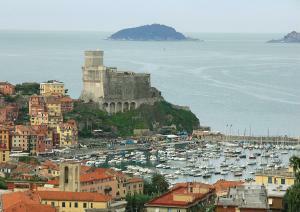 The Cinque Terre are best reached by train. 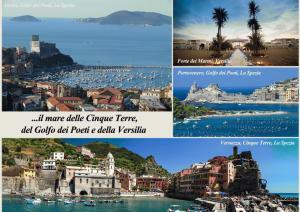 Take the train from La Spezia to Riomaggiore or you can continue to Monterosso. 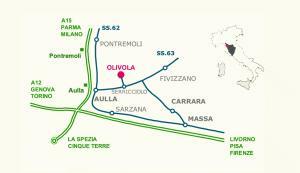 This old pilgrim route from Pontremoli to Lucca goes through our village Olivola, in front of our Casa Livia apartment. 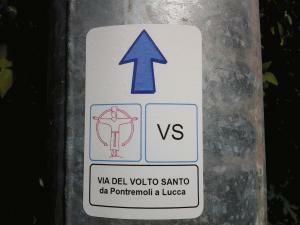 This way was an alter­native route of the ancient Francigena Road, today known as the road of the "Volto Santo" (Holy Face) covers Lunigiana first and then Garfagnana region lands full of history and traditions, following old mule tracks and going through well preserved ancient hamlets. In the past, it was used to skip the areas afflicted by malaria along the coast and pay homage to the wooden statue of the Holy Face, the Tunicate Christ cherished in the Cathedral of Saint Martin in Lucca, a pilgrimage since its mysterious and legendary disappearance. 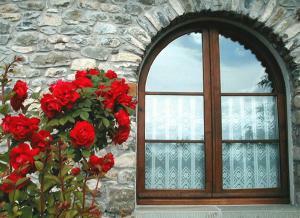 Equi Terme is a little thermal spa village - offering a variety of health and beauty treatments. 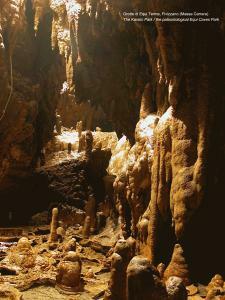 As well as the spa, Equi is also famous for its natural caves. 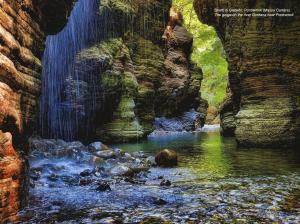 The straits are part of a SIC, Site of Natural Interest for the European Community, thanks to its geology and naturalistic features.Water trekking in the Stretti di Giaredo, natural protected area of exceptional beauty, walking along the high walls of its canyon, swimming in clear water and admiring millennial multi-coloured rocks. The parades take place in a ring-like circuit 2 kms. long, on the seaside avenue of Viareggio, best known as La Passeggiata.